There is a free zoo in the suburbs of Hilo. No lion or elephant but peacocks walk around in the zoo. It is the new white tiger. Previous one,name Namasute, means Hallow, died. Zoo also bought a Bengal tiger. They are playing as cats. They are very big so it is powerful. A lizard stared us with sinister look from near my steps. A python is swallowing a big rat. There are playground equipments. It is very good place for children. 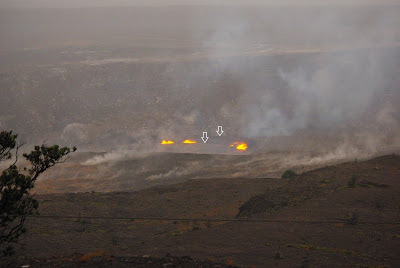 I saw white smoke of lave, Kilauea 61G Lava flow, pouring into the ocean from the south west. I approached from the north east because there is a gravel road. The point of the ocean entry was 5miles from the parking. There were many rental bicycle shops at the parking. Rental fee was $10 for one hour but few people borrow it. I could not understand why. It took 45minutes to the end of the road, blocked by lava flow. If I walked it may be 2hours. To see the ocean entry we had to go left on this lava field to the sea side. If fall down get serious injury. Just harden lava got a crack made by differentiation of temperature. Dynamic lava ocean entry. If wind blows from opposite side we would be able to see nothing. Sightseeing ship came from Hilo. Pay $100, it is easy to come here and can see near the entry but they approached twice, once was only for about five minutes. I am little bit well informed about Volcano so I think it is very reckless tour. When the collapse happens and viper explosion occur they get serious damage without the least resistance. Small explosion actually occurred at white circle point(click the photo), just after 10minutes the ship left. If it was there some passengers got burn. Pu'u 'O'o erupted in the white triangle mark. 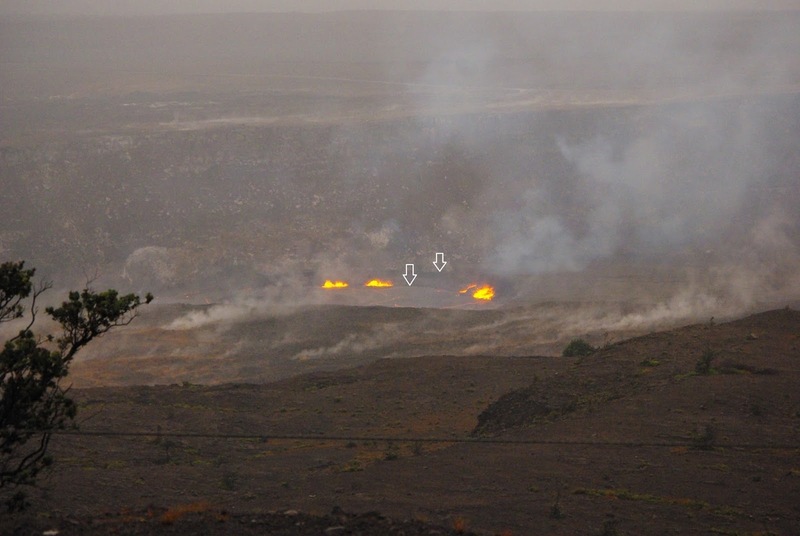 It is the source of this lava, lava flows in the lava rube and comes out on the ground at the red point (right side of this photo) and go into the sea. I blow my own trumpet it is very rare to take two point in one picture. I took picture until dark but big problem waited on the way back. I had only packet size LED flash light. It is very fearful to clime up on the pitch-dark, many clack lava field in the utter darkness with this poor light. And it was more dreadful to drive bicycle on the macadam road, in addition rear brake did't work. Suppose the terror to brake the front wheel at the down road covered with crushed rough lave. And one more addition low gear was broken so I had to pushed the bike at up hill road. I understood few person borrow the bike in the evening. I got mad I negotiated to discount 4hours $40 to $30. In such situation I could speak English fluently! West coast of Molokai Isl. Coconut Grove. It was off limit because of danger of falling coconuts like this. The Road to West coast. There were few houses but cows. The end of the rout. Kapukahehu Beach. Molokai's red dirt were carried by stream and piled arround. There were Many foot prints of animals on it. Quiet and beautiful beach. There was not a soul on the beach. I,Japanese, felt " How wasteful to let such a fascinating left vacant." 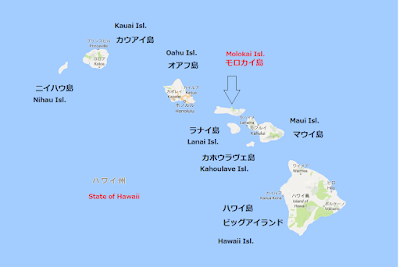 Next was Kapohaku Beach Park. Gold sand long beach was also empty. Goodbye Molokai!! Plane flied very low so we could see a beatiful site, air port and red cray land. A few buildings. 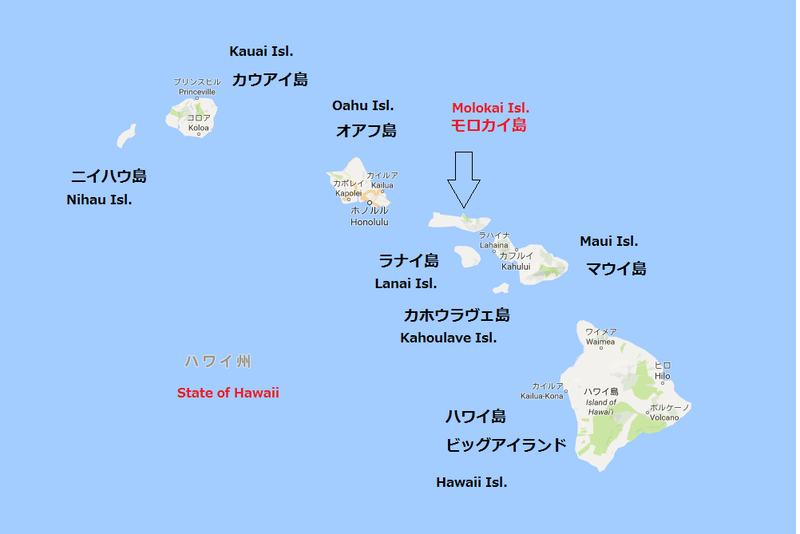 Maps of Hawaii state and Molokai Isl. Click them to see detail. 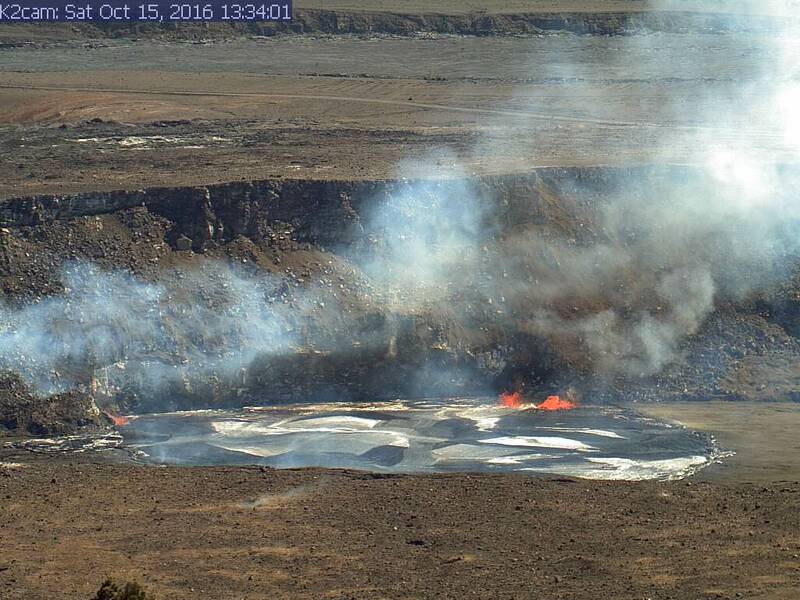 Could no go directly from Hilo, Hawaii Isl. to Molokai. From Honolulu to Molokai took 32minutes by this small propeller plane. I went to Halawa Valley. On the way there was a church which was built by Father Damian. There is a life size statue of him in front of the church. Halawa beach looking down from a mountain pass. We can see many water falls in the inner part of the valley from the beach. We stayed at Hotel Molokai. It is beside the beach. Rooms in bungalows, something like the a cabin of southern country natives. My room was under the high palm trees, seen in the center, only a few steps away from the shore. This picture took from the restaurant. I ordered beef steak, about $28. I chose broccoli and potato. Too big! The dish was good but beer was more to drink under the many stars in the heavens. This trail descends a 1780foot cliff and 3.2mile in length and has 26 switchbacks. Here we changed mule to bus tour. Mules took a rest and get food. White circle point they rescued two person who fell down from mules. A site of old hospital. We can see the houses, peace and quite now a day Kalaupapa. East end of the peninsula. The patients who carried by ships were living in such isolated place. 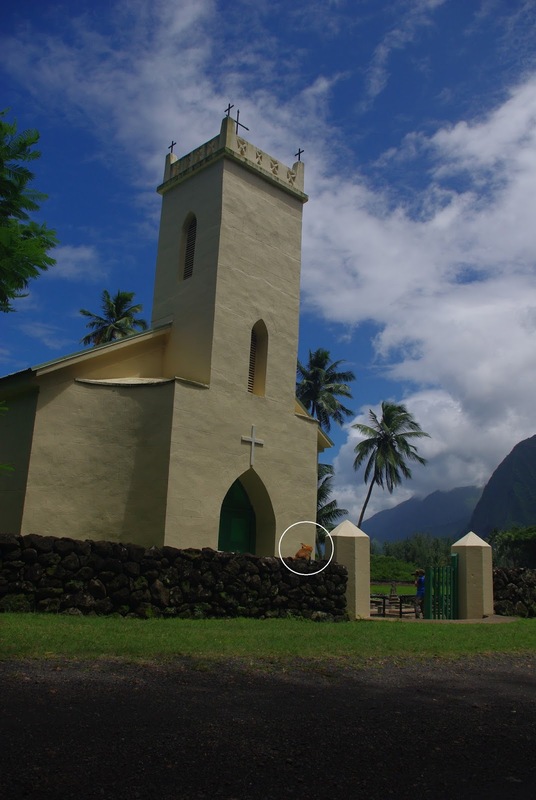 We cannot talk about Kalaupapa without the stories of Father Damian. 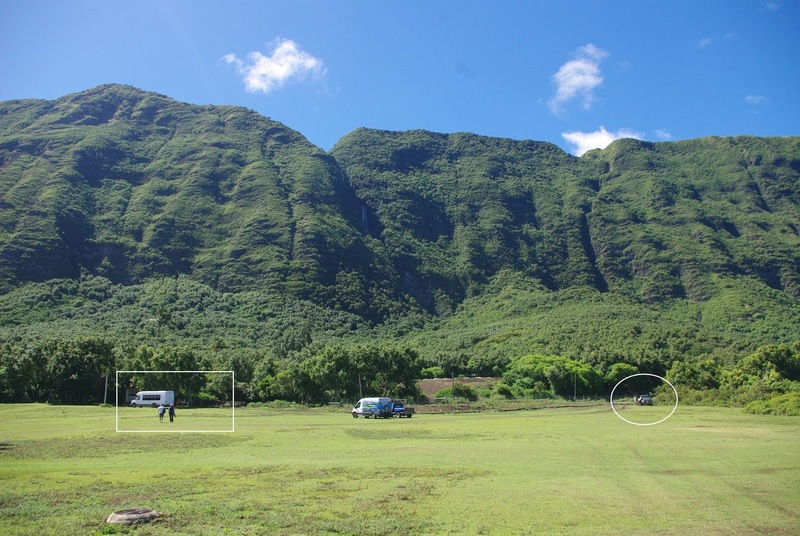 1866,Kalaupapa was chosen as the "dumping site" for Hawaii's ailing lepers. They ware carried by ship and were landed by crane with just a ten day ration of provisions.Survival was measured in few weeks.When they died other patients threw them into the hole. That's all!! Fatter Damian arrived here 1873 on two weeks mission. But he was so taken aback by the lepers' horrific plight, he stayed here for the rest of his life. At first he made coffins and made shelters,taught agriculture, encouraged and gave them human dignity. He himself developed leprosy and after 13years struggle against disease he died 1889. He was canonized 2009. This is the Church named St. Philomena's Church that Father Damian supervised its construction until he died. It was just before the East end and 1000yards far from the human dwelling but in white circle there is a cat with cat food in a bowl. Inside of the church and cat. It said as if "it is my territory" It took to human. The grave of Father Damian, decorated with flesh flowers. Mother Marianne, another Saint associated with Kalaupapa. Mother came to Kalaupapa to care for dying Father Damian. After his death she nursed patients, taught and guard girls etc. She died 80years old, not leprosy. And also canonized. Inside of the St. Elizabeth Church. Our guide sang Chant for us. 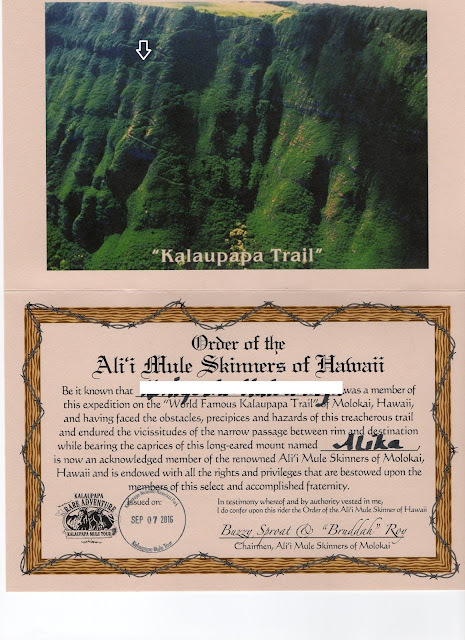 It is said the all guides of Kalaupapa are former patient? He talked about Mother Marianne achievement in front of her grave but he could not speak because of moving tear so Sister continued his story. The graves of Leper patients. At first they were just thrown into the holes when they died. But Father Damian was stickler for coffin and grave to keep the human dignity of lepers. We came back by riding mules. Beginning is the comfortable trail along the beach side. My Alika was already behind the group. To go up is easier to go down. And back to a stable. The mule for a person who was carried by helicopter was empty. They gave me a Certification of the tour. White arrow is the place that my mule fell down from the precipice. There is a name Alika, my stupid and cute mule.